I have used several sources to check information, I must mention “Morsum Magnificat”, “The Vail Correspondent”, Tom Perera’s “Telegraph Collectors Guide”, Fons Vanden Berghen’s “Classics of Communications”, Greg Ulsamer’s “Faszination Morsetasten”, Herbert’s “Telegraphy”, Tom French’s “Bunnell’s Last Catalog”, The Eastern Telegraph Companies “Telegraph Engineering” books, Marilyn Albers and Jack Tod’s “Worldwide Porcelain Insulators”, W. Keith Neal´s “Searching for Railway Telegraph Insulators” and “Railway and Other Rare Insulators” and others, plus the help received from many colleagues, too many to mention, lest I forget some. The possible errors contained in the descriptions of the items shown are entirely my own. 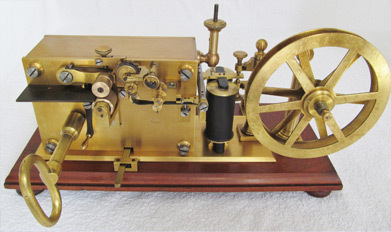 This is somewhat of a wishful thinking, since it is not easy to divide into well defined sections the various telegraph items in my possession. The idea was to show items grouped by use, characteristics or any other common factor. I tried to be systematic and logic, something that, I have to admit, hasn’t been always achieved. So I ask the patient browser, if any, to be generous in his (her) judgment. The knowledgeable person going through these pages is most welcome to make comments, suggestions and, above all, corrections. My email address is given somewhere else in this page.